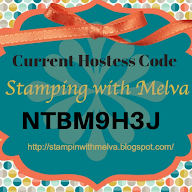 Stamp with Melva: Have you checked out Shimmer Paint? So much fun! 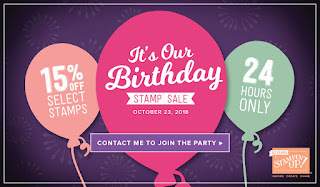 Today's card features a few new products from the Stampin' Up! Holiday Catalogue - the Merry Christmas Thinlits Dies, Blizzard Thinlits Die, Shimmer Paint and Festive Farmhouse Designer Series Paper. I had an idea for a card to use up some of the snowflakes I had cut out for a class using the Blizzard Thinlits Die and it gradually grew into this. I like how it turned out in the end :). Do you ever had cards where the final product is nothing like you planned? For this card I cut out the "Merry" in Crumb Cake cardstock and then painted it using a dry Aqua Painter with Champagne Mist Shimmer Paint. I also painted the snowflakes that I cut out from Dazzling Diamond Glimmer paper. Check out the shimmer! I adhered a piece of Vellum Cardstock over the Designer Series Paper and lightly painted it with Shimmer Paint. You need to paint it very lightly so as not to saturate the paper. Let it dry and then adhere in a couple of places with Glue Dots. If you adhere it in places where you will put something over top of the Glue Dots, you will not be able to see the adhesive. Stampin' Up! is celebrating their Birthday today for 24 hours only! You don't want to miss out on the specials. You can save 15% on select stamp sets. Check them out here.